HERBAL ENERGY SHOT is a liquid complex of carefully selected and concentrated guarana as well as American and Korean ginseng extracts. Despite the fact that guarana grains contain four times more caffeine than popular coffee, it is released for a longer time and its action is more moderate. The inhabitants of Asia and America have consumed ginseng roots for many years during periods of stress and fatigue. 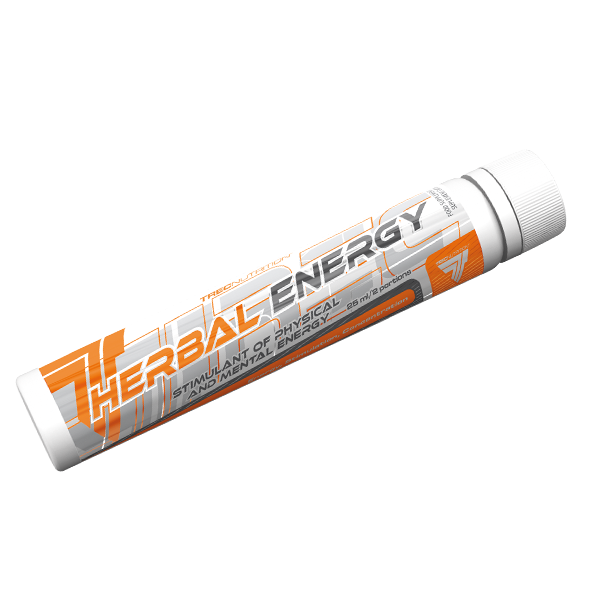 HERBAL ENERGY is a diet supplement recommended for very active persons, including sports people. Take a single serving of the product ‒ 12,5 ml (1 tablespoon) with 300 ml of water. Take two times daily, preferably before breakfast and 30 min. before the workout. Please note! Do not take before bedtime! Do not use more than 3 months. Shake before use. INGREDIENTS: water; saccharose; dextrose; guarana extract [seeds](Paullinia cupana) [10% caffeine] (6,0%); acidity regulator –citric acid; aromas; korean ginseng extract [root](Panax ginseng) [10% ginsenosides] (0,4%); american ginseng extract [root] (Panax quinquefolium) [5% ginsenosides] (0,4%); stabilizers – guar gum, xanthan gum; preservatives –potassium sorbate, sodium benzoate; sweetener –sucralose.